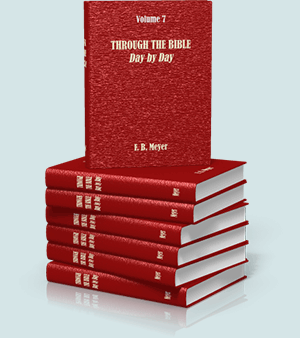 Through the Bible, Day by Day is a devotional Bible commentary by Frederick Brotherton Meyer (1847-1929). Meyer was a Baptist pastor in England, a co-laborer of evangelical work with D. L. Moody and A. C. Dixon. Originally published in 7 volumes, Day by Day is a commentary focused on personal application and is esteemed highly even by some who rarely take an interest in devotional writings. Meyer believed and taught the imminent return of the Lord. Though born in London, he made tours to North America, South Africa, and other areas in his work, even in the latter years of his life. At the time of his death, secular publications wrote of Meyer and his contemporaries as participants in a "wide and increasing empire of Christendom" (New York Observer) for their public work. The introductory material and outlines for each book of the Bible appears on the first verse of each book. 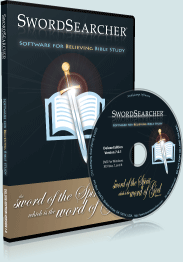 The review material for each book of the Bible appears after the introductory material, on the first verse of each book. A "Day by Day" reading passage and commentary is presented as a commentary on the first verse of the passage. Meyer's "Day by Day" reading divisions cover most of the Bible (about 85%), but not the entire Bible. There is need everywhere for the cultivation of the habit of reading some portion of God's Word each day. Such reading should be consecutive, for only thus can continuous interest be maintained. It may also be greatly helped by an interpreter, who will explain what is obscure as well as suggest applications of the message to the daily life. Mr. Meyer's life-long experience in interpreting the Bible to the common people makes him pre-eminently fitted for this service-a crowning one in his world-wide ministry by voice and pen. The Bible is full of God's wisdom. It is the Word of God. We must read it not only with our head, but with our heart. An analysis of its contents is good and desirable; but when all this is done, we need to allow time for the inner wisdom, power and grace which are stored in the Book, to soak into our inner consciousness. Therefore, for some reasons, it is better to have a shorter portion for daily study, to give us time to get all the juice and marrow out of what we read. It has always seemed to me that the true way to know the Bible is to read it through. It is only so that we can follow the unveiling of the divine purpose, from the Dawn of Genesis to the Perfect Day of the divine writings of John. It is only so that we can obtain a connected view of the wide scope of Revelation. To read in different, unconnected passages, now of Poetry, now of History, now of Doctrine, prevents the mind from getting proper focus. We are apt by that method to concentrate on a few familiar passages, instead of listening to all that God has spoken to men's hearts. There is, probably, nothing more vital to an accurate knowledge of the Bible than the good old practice of reading it thoughtfully and steadily through with such brief notes as this volume provides. But let it always be remembered that the profoundest knowledge of the Word comes from the illuminating grace of the Holy Spirit. Ask Him to unlock and unfold its sacred mysteries. Ask Him to reveal the glories of our Lord in every chapter. Ask Him to enable you to "read, mark, learn and inwardly digest." Ask Him, finally, to enable you to become not a forgetful hearer or reader, but a doer of the Word. See to it that your reading is combined with the faith that claims of God the fulfillment, in your own experience, of all He has promised. No prayer, therefore, is more salutary, as you open your Bible, morning by morning, than the familiar old words of the psalmist: "Open thou mine eyes, that I may behold wondrous things out of thy law."